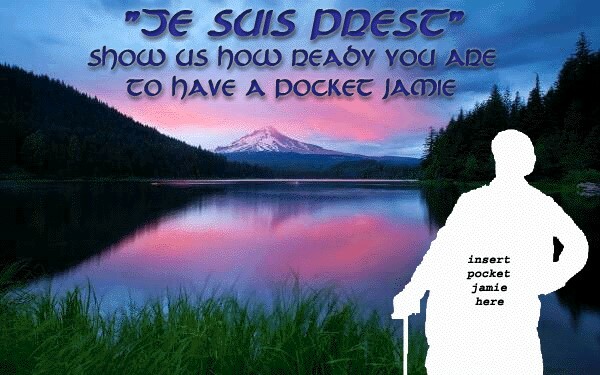 So what would you do with a Pocket Jamie? Tweet a picture that clearly shows the spot where a pocket Jamie should be. Make sure the tweet includes both of the hashtags #pocketjamie #insertPJ. Be creative and entertaining. The 5 answers with the most favorites that include both of these hashtags will be finalists. The secret panel of judges will determine the 2 winners from this group. You will need to follow the @heughligans account to be awarded your prize, since we will need to be able to contact you to arrange shipping. To see what other people are saying and vote on your favorites by favoriting them, use this twitter search #pocketjamie #insertpj. All entries must be received by: February 24, 2014. Entries posted as comments on this page won’t count. You must post the entries to Twitter. Thank you, Donna! I can do that. Seems a bit obvious, now, too! Good luck! 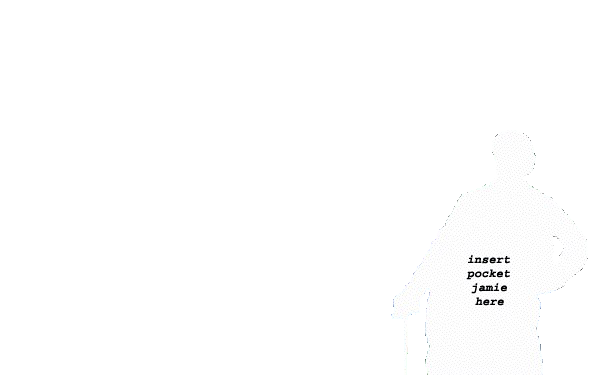 I believe I am at a loss as to how to insert the empty Pocket Jamie form into a photograph. Does anyone have any tips? I have basic computer knowledge but a fairly tech-savvy daughter.